Bakersfield Observed: So who knew Bakersfield High School was haunted? 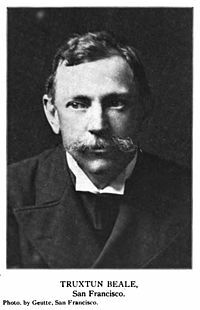 And how much do you know about Truxtun Beale? So who knew Bakersfield High School was haunted? And how much do you know about Truxtun Beale? *... WHO KNEW? : A group of local residents is starting a campaign to encourage everyone to appreciate Bakersfield and all its quirks. They're busy sending me quirky "who knew?" tidbits and here's the first. Legend has it that Bakersfield High School, 118 years old, is haunted. Years ago a couple would cut class and be spotted kissing at the top of the Griffith Stadium. They were later killed in a car accident and to this day, coaches report seeing the image of that couple embracing at the top of the stadium after football games. * ... TRUXTUN BEALE: How much do you know about Truxtun Beale, namesake of both Truxtun Avenue and Beale Park? He was born in San Francisco, graduated from Pennsylvania Military College in 1974 and studied at Columbia Law School. Instead of becoming a lawyer, he became manager of his father's Tejon Ranch, a position he held for 13 years. In 1891 he was appointed United States Minister to Persia and a year later, minister to Greece, Romania and Serbia. When his father died in 1893, Beale assumed ownership of Tejon Ranch. In 1912, he sold the ranch to a syndicate of investors headed by Harry Chandler and Moses Sherman. He was married twice, first to Harriet Blaine and later to Marie Oge, granddaughter of Salmon P. Chase, former governor of Ohio and U.S. Treasurer under Abraham Lincoln. Beale died on June 2, 1936, at his country home near Annapolis, Maryland. Thanks to local history buff Larry Kirkland for helping with this mini biography. * ... BARKER OUT: Jim Barker, president of Hillcrest Air Conditioning, is leaving town to take a job in Boise, Idaho. Barker told me he will be vice president of new business development at a similar company owned by a personal friend. "Bakersfield has been so good to us but this seemed like an opportunity to take on a new adventure," he said. "It's a great town for the outdoors and the fishing is incredible." Jim and his wife Sarah know Boise well since their daughter is a junior at Boise State University. * ... DID YOU KNOW? Did you know that the Tegeler Hotel at 19th And H streets was originally five stories high? The fifth floor was removed after being damaged in the 1952 earthquake. When it was built in 1914, it had a basement cafe and a rooftop garden lined with palm trees. * ... ARTS: With all the budget pressure on our local schools, it's good to see folks coming together to keep vital programs alive. One of those efforts involves the Friends of the Fine Arts (FoFA) at Bakersfield High School, which is having its annual fund raiser March 19th at Juliana's Art Studio and Gallery, 501 18th Street downtown. This is a worthwhile event to support the arts, and you can do so for just $30 a ticket. That includes a light dinner by Valentien and one glass of wine. Lawanda Smith, a fabulous jazz singer, will provide the entertainment. There will be a silent auction involving some terrific gifts. For tickets call (661) 619-2831 or (661) 327-5429. * ... FUND RAISER: I erred in a recent post about a fund raiser this weekend for the Henrietta Weill Child Guidance Center by implying it will include a dinner from Cafe Med. Truth is, a Cafe Med dinner is one of the auction items but the $75 ticket will still get you a wine tasting and food by the Guild House staff. Call Toni Ross at 661-322-1021, ext. 186, for tickets. The event is this Friday. * ... BAKERSFIELDISM: You know you're a Bakersfield old timer if you remember "when hundreds of taranchulas crossing Seventh Standard Road at Enos Lane in the 1950s." Thanks to loyal reader Doris Patrick for that one. The Chicago Trubune (June 7, 1936) has a death notice for Truxon Beale published BUT the NY Times ran a wedding announcement for the Beale/Oge union. The headline uses Truxtun but the body of the article uses Truxton. That's not the interesting part. It seems that on December 4, 1902 Beale and Thomas Williams Jr attacked Fredrick Marriot the editor & proprietor of a San Francisco newspaper. They shot Marriot 3 times because he refused to retract an "untrue" article about Miss Oge. Beale and Williams were acquitted and Thomas recovered. I would like to know what the original article reported. Who cares about the proper spelling of Beale's 1st name?! I thought BHS had a hospital on the site of current Elm Grove. It was rumored that bodies are still buried there. Rumor or truth? I remember when there used to be great big gopher snakes turning up in garages in Westchester in the '50s. And I mean the 'real Westchester,' not what the real estate agents started calling downtown Bakersfield! And, when the land below the bluffs was open and wild and we could ride our horses as far as we wanted to go.